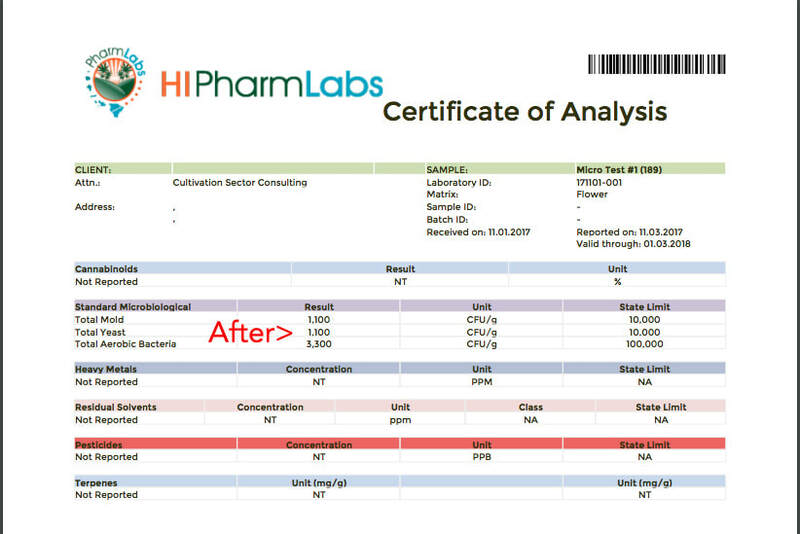 Passing microbial lab tests for harvested cannabis has proven to be a challenge for many licensed cannabis flower producers. This is because these microbes are not visible to the human eye and their populations can vastly increase over the course of just a few hours. The conventional wisdom has always been that dryer cannabis is cleaner cannabis, but our internal testing has show that cannabis dried down below 6.5% moisture can still harbor yeast, mold and fungi in quantities and densities that cause lab failures in many states. It does help to dry the flowers more- it's just only half of the battle in most cases. One of the big sticking points with lab standards (created by the States' Depts. of Health) is that, currently in most states, microbes that are non-pathogenic are still counted towards the total allowable CFU's. It turns out that all harvested and dried agricultural products have microbes on them in much higher quantities, but due to an abundance of caution in a new and poorly understood industry, regulators are being more strict with cannabis than with other consumable products such as tobacco, fruit, and vegetables. Hopefully. over time, regulators will gather enough evidence to ease the rules for cannabis growers. 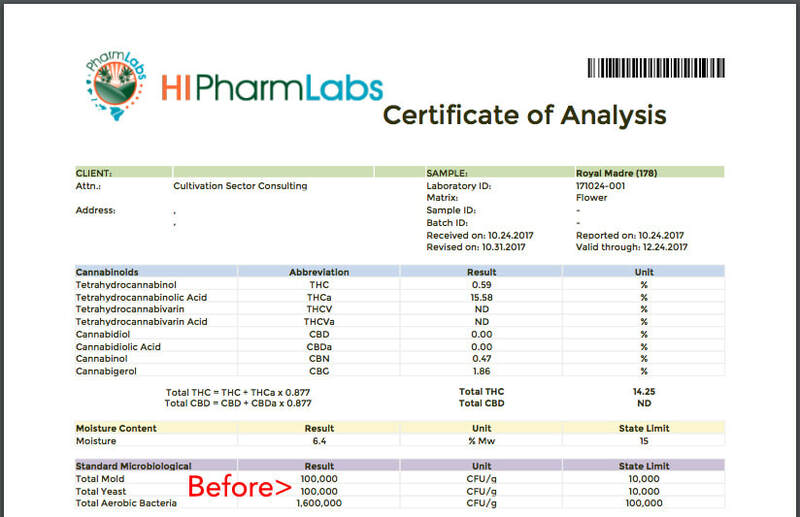 For now, we have to take extra steps to sterilize dried cannabis flower material before submitting it for microbial lab testing. The first method that comes to mind when attempting to sterilize something is the process of oxidation. This would mean using something like hydrogen peroxide or ozone to kill microbes in and on the marijuana flowers. This actually does work if you can penetrate the surface of the flowers deeply enough, but because terpenes are such unstable organic compounds, oxidation also kills the valuable odor of your crop. Without the nose, forget fetching a high price per lb. Smell is everything when it comes to cannabis value. Another approach to kill microbes is UV light, and again, this does help kill microbes on the surface of the flowers, but it doesn't penetrate into the flower crevices where much of the microbial activity is likely to occur.